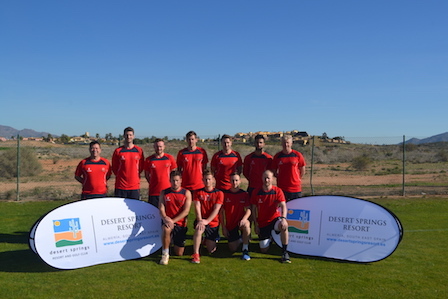 The 2014 World Amateur Team Disabled Golf Champions, The Swedish National Amateur Disabled Golf Team, are now back in Sweden having completed a successful seven (7) days of warm weather training between Sunday 26th March & Sunday 2nd April at Desert Springs Resort, Europe’s only international award-winning luxury family resort and championship desert golf course, in the Almanzora region of Almeria, Andalucía in south-east Spain. 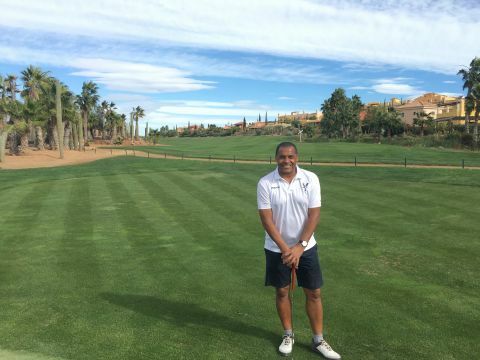 During their time at the resort the players utilised the excellent practice facilities at the Golf Academy and played the Championship Indiana course. “We have been coming to Desert Springs for some years now and we love the resort, the golf course and the weather, which is much better than in Sweden currently! The players and officials where accommodated in one of the privately owned Country Villas normally reserved for holidays and short breaks at Desert Springs and the resort’s executive chef was on hand to cater for the special dietary requirements of individual players dining in the award-winning El Torrente Restaurant. Great for golf and tennis. The villas are great with a private pool (not heated). We went in March and the weather was perfect. The resort was lovely and quiet so it was easy to get a tee time or to get access to the tennis courts. We loved the local town and enjoyed lunch in the market square. There is a also a fabulous restaurant nearby for the more adventurous food-lovers called Juan Moreno in Vera. It’s well worth the journey. Somerset County Cricket Club players are now back in England having completed a successful ten (10) days of warm weather pre-season cricket and fitness training between Monday 6th – Thursday 16th March at Desert Springs Resort, Europe’s only international award-winning luxury family resort and championship desert golf course with its very own dedicated Cricket Academy, in the Almanzora region of Almeria, Andalucía in south-east Spain. Seven Somerset CCC coaching staff accompanied twenty-two (22) players who completed bowling, batting and fielding practice as well as strength and conditioning training sessions as they stepped up their physical preparations for the upcoming 2017 season. The training camp worked on a specific and carefully planned programme covering technical skills, strength and conditioning and both individual and group activity that included golf on the championship Indiana course as well as a mountain bike ride! From: Roelof & Eileen J. It took us a while to research and find a quality golf resort with an English speaking golf pro and we found Desert Springs and Neil Evans. We only started golf a year and a half ago and had taken some lessons but we really felt we needed a boost. So we were looking for daily lessons and a game in the afternoons. Neil organises not only the golf for you but also the accommodation and received us with a big smile when we first arrived at the resort. The resort is really nice, spacious well maintained and so is the golf course. A bit tricky for beginners but nothing we were not able to deal with. While we very much appreciated the quality of the resort, first and foremost we would come back for Neil. We can highly recommend him for anyone who is looking for a patient and calm way of teaching, and especially his skill in explaining movements in multiple ways. He helps client prefect their setup so as to increase the chance of hitting the ball exactly right, and covers all areas that one might need to perfect ones swings and techniques. Thank you, Neil for seven days of intense improvement to be repeated asap. Lancashire County Cricket Club players are now back in England having completed a successful four (4) days of warm weather pre-season cricket and fitness training between Sunday 26th February – Thursday 2nd March at Desert Springs Resort, Europe’s only international award-winning luxury family resort and championship desert golf course with its very own dedicated Cricket Academy, in the Almanzora region of Almeria, Andalucía in south-east Spain. Glen Chappel (LCCC Head Coach), Sam Bryne (LCCC Team Physio) and Warren Hegg (LCCC Business Development Manager), accompanied eight (8) players who completed bowling, batting and fielding practice as well as strength and conditioning training sessions as they stepped up their physical preparations for the upcoming 2017 season. Speaking of the grass wickets Glen remarked: “The wickets were a touch ‘spicy’ on day one but flattened out beautifully for the rest of the stay. The wickets lasted the full 4-days of heavy use, our ‘net’ wickets outside Old Trafford CG only last 3-days! The players and coaches were accommodated in some of the privately owned apartments and villas normally reserved for holidays and short breaks at Desert Springs and the resort’s executive chef was on hand to cater for the special dietary requirements of individual players dining in El Torrente Restaurant. 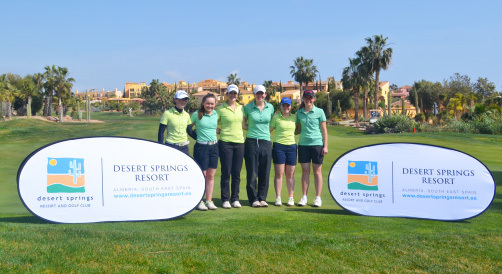 Between Tuesday 21st – Saturday 25th February, three (3) officials from the Irish Ladies Golf Union accompanied six (6) girls aged between 15 – 23 years for 4 days of warm weather winter training at the Desert Springs Resort. 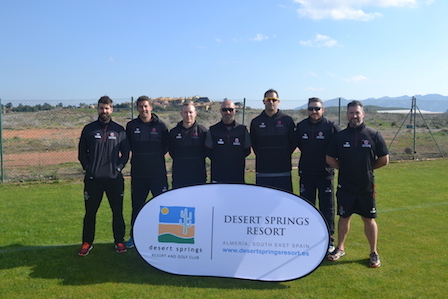 The training camp utilised the Gym at the Sierras Sports Club and the excellent practice facilities at the Desert Springs Golf Academy where the ILGU Coaches were able provide one-to-one tuition and take advantage of the use of the Desert Springs short game academy. The students and officials were accommodated in some of the privately owned townhouses and villas normally reserved for holidays and short breaks at Desert Springs and the resort’s executive chef was on hand to cater for the special dietary requirements of individual players dining each evening in El Torrente Restaurant. Matt Ellis, Golf Academy Manager & PGA Instructor, Neil Jones, Level Two Tutor, Paul Johnson, Level One Tutor & and Joanne Cawthorne, P.A to the Performance Director at Hartpury College Golf Academy, accompanied thirty-one (31) students aged between 16 – 18 years for 5-days of warm weather winter training at the Desert Springs Resort between 29th January & 03rd February. “The practice facilities here are just awesome! 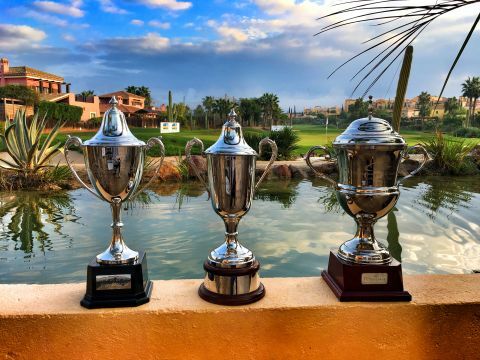 Those are the verdicts of Alexandra Giles of the England Regional Squad, Alex Talbot of the England Regional Squad and Reece Swain, all full time students from the Hartpury College Golf Academy. The training camp utilized the excellent practice facilities at the Desert Springs Golf Academy where the PGA Instructors were able provide one-to-one tuition and take advantage of the use of the Desert Springs short game academy prior to the students embarking on their rounds on The Indiana course. The students and officials were accommodated in some of the privately owned apartments normally reserved for holidays and short breaks at Desert Springs and the resort’s executive chef was on hand to cater for the special dietary requirements of individual players dining each evening in the ‘The Crocodile Club’ Restaurant. 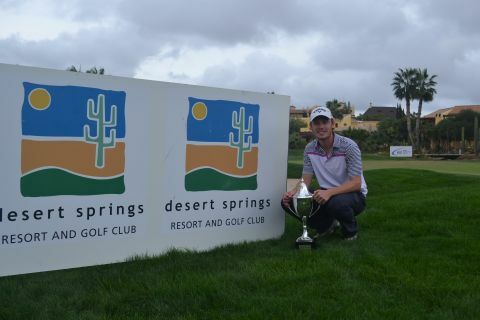 “This was my first visit to Desert Springs, what a resort! We were made to feel welcome by everybody and the facilities are first class. 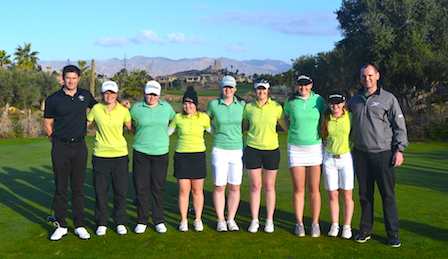 Between Tuesday 3rd – Saturday 7th January, three (3) officials from the Irish Ladies Golf Union accompanied seven (7) girls aged between 15 – 23 years for 4 days of warm weather winter training at the Desert Springs Resort. That is the verdict of 16-year-old Valerie Casey, one of the ILGU International Squad members. 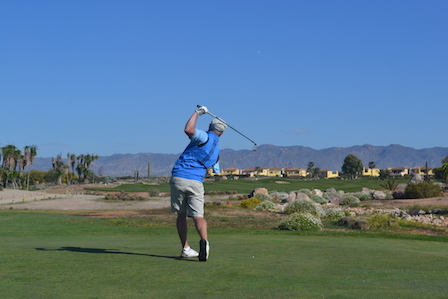 The training camp utilized the Gym at the Sierras Sports Club and the excellent practice facilities at the Desert Springs Golf Academy where the ILGU Coaches were able provide one-to-one tuition and take advantage of the use of the Desert Springs short game academy. The students and officials were accommodated in some of the privately owned apartments normally reserved for holidays and short breaks at Desert Springs and the resort’s executive chef was on hand to cater for the special dietary requirements of individual players dining each evening in El Torrente Restaurant. Golf is great despite poor weather for the time of the year. Very good course and excellent service from the golf team…… Overall the golf resort of Desert Springs is well worth a visit. My husband and I have been playing this course at least once a year, one week per visit. 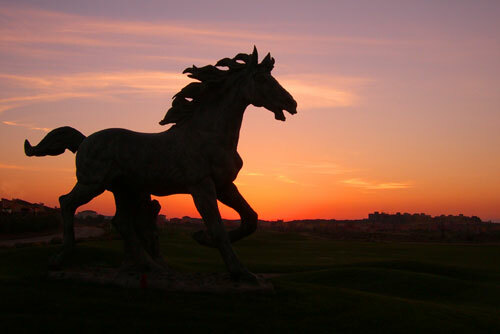 Everything is perfect about this golfing holiday, the course, weather, the stay, staff…. We are going again in a month’s time! I would like to thank the management and staff at Desert Springs Resort in Almanzora for a fabulous few days in the November sun. Everyone was so helpful, the accommodation was great and the food superb. It was my first visit to the resort, I doubt it will be my last. Special thanks to the Golf Operations Manager Alfonso Castineira Marcos for the tips on the range and the course. I hope all is well. I can’t believe it’s been a week already! 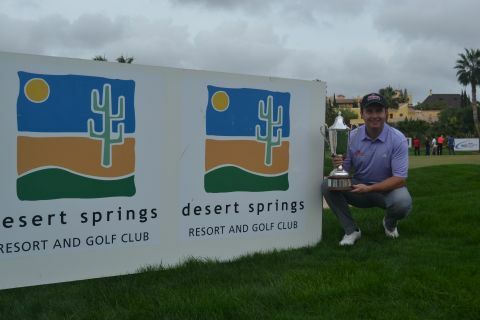 I just wanted to say a massive thank you to all the staff at Desert Springs. The hospitality was fantastic and the accommodation was superb, it’s definitely a place I would return to. Myself and the referee’s thought the course was set up fair and the greens were fantastic, praise goes to Anthony and his team. I hope you have an excellent end to the season and best wishes for 2017. “Awesome facilities on a great resort! "Thank you so much! 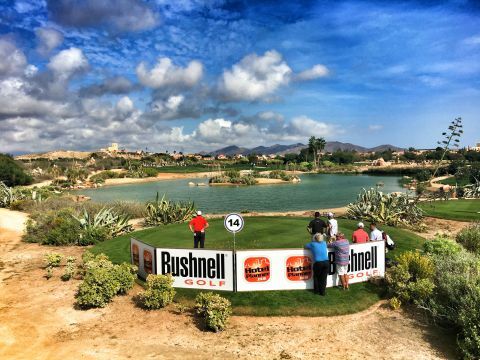 Great course, great place." ‘We booked a golf break with some trepidation, but we need not have worried. My non golfer husband and I both had a great week. The booking process, standard of accommodation and mechanics of the holiday were all great, designed to meet our own particular needs and very well organised. ‘Just back from an excellent five day break including tuition with Neil which was thoroughly enjoyable in every respect. 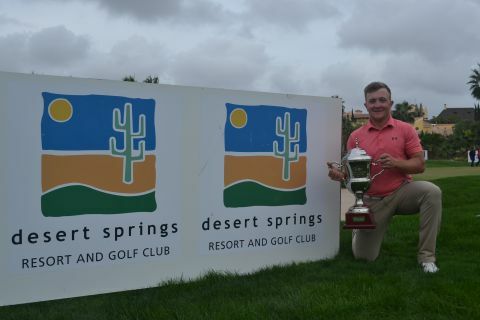 Desert Springs is a must if you like first rate facilities, accommodation and food in a very relaxed atmosphere but undoubtedly the icing on the cake for me was the time spent with Neil learning and improving my golf. 'We booked a golf break with some trepidation, but we need not have worried. My non golfer husband and I both had a great week. 'Just back from an excellent five day break including tuition with Neil which was thoroughly enjoyable in every respect.